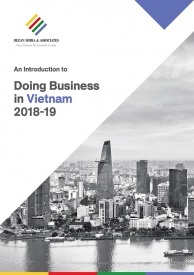 Vietnam has undergone a substantial change in its economic structure in the last decade, shifting from agriculture to the industry and services sector. Since 2006, the service sector has had the highest share in the GDP distribution, followed by industry and construction, and agriculture. The supporting industries focus on the supply of raw materials, spare parts, and components to manufacturing industries, thus becoming a substantial determinant of the industrialization process of Vietnam. With the potential of becoming “the next Asian manufacturing hub”, driven by an abundant labor force and low labor cost, the FDI capital inflow into Vietnam in 2017 reached US$35.88 billion, the highest figure since 2007, with 44 percent going towards the manufacturing and processing sector. However, to maintain the FDI interest in middle and long-term local investments, it is crucial to develop a sustainable supporting industry system by increasing the localization rate and maintaining a stable supply of raw materials, components, and spare parts for the industrial sectors. A high dependence on imports for the supporting industries, will lead to higher risks and increase the costs for enterprises. According to the Japan External Trade Organization – JETRO, the localization for materials, components and spare parts of Vietnam is solely at 34 percent, while the rates for Thailand and China are 57 percent and 68 percent, respectively. The involvement of Vietnam’s supporting industries in the supply chain of FDI enterprises is assessed as low. According to The Vietnam Chamber of Commerce and Industries, there are around 151,000 enterprises working under the industrial and construction sector in Vietnam, however, only 1,400 Vietnamese companies, mostly rated SMEs, are engaged in the supporting industries. Only 20 percent of them meet the criteria to engage in the global supply chain and 36 percent of them can join the export-oriented production. 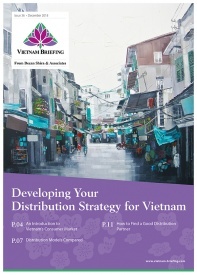 Outputs of Vietnam’s supporting industries solely caters to 25 – 30 percent of overall demand for the industrial sector. According to the General Statistics Office of Vietnam, the trade deficit in the first nine months of 2017 had reached US$ 500 million. Despite having four key sectors with export turnovers of over US $10 billion, high import values of machinery, instruments, accessories, telephones and their parts have led to a deficit. Vietnam’s garment and textile industry are expected to achieve a growth rate of 41 percent by 2020 according to World Bank. However, fabric production only meets 15-16 percent of the domestic demand due to lack of domestic cotton suppliers. Every year, Vietnam needs to import cotton at a rate of 80-90 percent of total demand. According to Vietnam Manufacturing, the imported value of the electronics sector accounts for 77 percent of the total value generated. Domestic production mostly focuses on plastic-rubber components and spare parts. FDI and JV enterprises are dominating the market with their highly-qualified products, while Vietnamese enterprises are still engaged in simple and low value-added processes like packaging, production of manuals, and plastic components. Vietnam’s population is forecast to reach 100 million by 2025, an increase of 5.8 percent from 2016, with 60 percent of them being of working age. 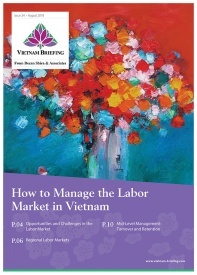 As for labor costs, when compared to neighboring countries, Vietnam has a very low cost of labor of around US$2,354 per year, while wages in manufacturing are around US$240 per month. 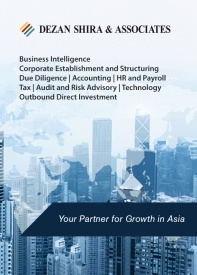 According to Deloitte, all members of Asian “Mighty 5” (MITI-V), i.e. Malaysia, India, Thailand, Indonesia, and Vietnam, ranked among the top 20 in the 2016 Global Manufacturing Competitiveness Index. Vietnam ranked 18th, followed by Indonesia. However, Vietnam is predicted to rank 12th by 2020, thus surpassing other group members except for India. 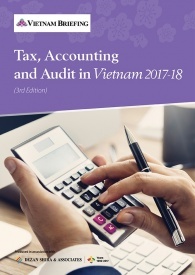 In early 2017, the Vietnamese government issued Decision 68/2017/QĐ-TTg on the development plan for the supporting industries over the 2016-2025 period. The Decision is to promote, support, and attract domestic and foreign investments into the supporting industries to create outputs that meet the demand of domestic production and exports and create a gateway for Vietnamese enterprises to step into the global value chains. Investment projects involved in the supporting industry, also known as secondary projects, shall be exempted from land rent for seven years. Investment projects in craft villages and projects on technical infrastructure located in the supporting industry zone will receive an exemption for 11 years. VAT: the turnover of products from the List of prioritized supporting industrial products shall be subject to the option of declaring VAT on a monthly, quarterly, and yearly basis. Environment protection scheme: a loan at a preferential rate from the Vietnam Environment Protection Fund for the pollution treatment and environmental protection activity of the projects. In addition, projects carried out by SMEs shall receive additional incentives on investment credit and water surface/land price subjected to some conditions. Participation in the ASEAN Free Trade Area has paved the way for Vietnam to lower electronics tariffs from 15 to 20 percent to zero to 5 percent. The huge reduction in tariffs has encouraged numerous major global electronics manufacturers to move some of their production lines to the country. Samsung, Foxconn, LG, Panasonic, and Intel are few of electronic giants that have invested in Vietnam. The entry of electronics giants has strongly encouraged providers of electronics parts. Since Samsung constructed its world’s second largest electronics factory, namely Samsung Electronics Ho Chi Minh Complex with a total investment of US $2 billion, four FDI projects operating as satellite projects for Samsung’s core projects have already obtained investment registration certificates. This creates a new trend that matches the current domestic demand of electronics parts. The same trend was seen when LG and Microsoft entered Vietnam. 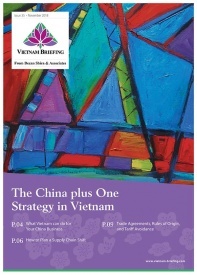 The capability of the supporting industries in Vietnam is currently assessed as low. Most of the firms in the supporting industries are small and medium-sized and lack capital to invest in newer technologies or labor training. Hence, the Vietnamese government needs to continue their support through incentives and other support measures, so that the supporting industries can increase their participation in the global value chain.